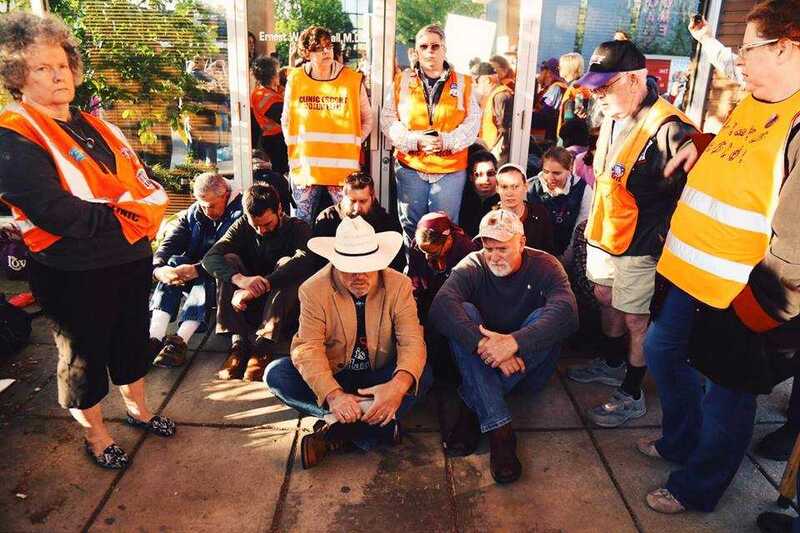 LOUISVILLE, Ky. — 10 people were arrested on Saturday as they blocked the entrance to Kentucky’s last remaining abortion facility to prevent mothers from murdering their unborn children. The effort corresponded with Mother’s Day weekend. Abortion opponents from across the country gathered outside of EMW Women’s Clinic in Lexington to preach the gospel and stand for life. Some of those present, including a pastor, missionary and several youth, sat in front of the entrance to the facility, a practice commonly known in the 1990’s as a rescue. A statement released by one of the entities associated with the effort, Operation Rescue/Operation Save America, outlines that those involved believed that preventing murder superseded the consequence of arrest. At approximately 11 a.m. local time, police were called to the scene and witnessed some sitting on the ground in front of the main door to the facility. Rescuers were asked to leave the premises, but refused. Some reports state that they rather linked arms. Police proceeded to arrest those blocking the entrance to the abortion facility. They were charged with trespassing and released. As previously reported, EMW Women’s Clinic has been on the verge of closure over technical problems with the facility’s attempts to comply with state requirements to have agreements with a local hospital and ambulance service in the event of a medical emergency. Attorneys for the facility sued over the matter in March and a temporary injunction was granted, allowing the location to remain open. “If Plaintiffs are forced to close their doors, Kentucky women will have almost no ability to access abortion in their state. Some would attempt to induce abortion without a medical provider; others would be forced to delay their abortions in order to travel long distances to other states, which increases the risk and cost associated with the procedure; and some will be forced to carry to term against their will,” the lawsuit contended. The EMW Women’s Clinic’s Lexington location closed earlier this year as it had been operating without a license, and its landlord decided not to renew the organization’s lease. The facility had been locked in a court battle over the license requirement, which it lost last August as the rule was upheld by the Kentucky Supreme Court. The Louisville location, which already had attracted regular opposition, has consequently become the focus of those who would like to see Kentucky emerge as the first abortion-free state in the nation.